Da Shih Hotel is centrally located in Hualien City with easy access to Taroko National Park, Buluowan, Taroko Gorge, Tunnel of Nine Turns and many other splendid Hualien attractions for your Taiwan travel. Mirakami Inn is a modern Hualien hotel close to Jhihsyue Railway Station, National Dong Hwa University, Hualien Farglory Ocean Park, Shin Kong Chao Feng Ranch, Taroko National Park, Carp Lake, Li Chuan Aquafarm for your Taiwan travel. 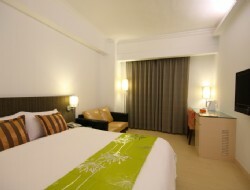 Ola Hotel Hualien offers comfy accommodations in Hualien City, Taiwan, with easy access to Hualien attractions include Taroko National Park, Hualien Harbor, and. Nanbin Night Market for your Hualien travel. Unique Holiday Inn is a nice Hualien hotel located close to Hualien Railway Station, Hualien Airport, Taroko National Park, Buluowan and Hualien Nanbin Park for your Hualien travel. 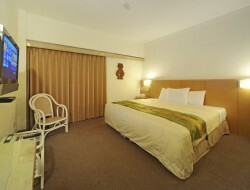 Located in Hualien, Travel Road Motel is a convenient accommodation for the guests to explore this vibrant city. 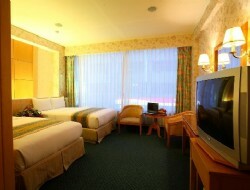 The hotel provides easy access to important town facilities. Also within easy reach are Rainbow Night Market, Hualien Cultural, Creative Industries Park, and Pine Garden. 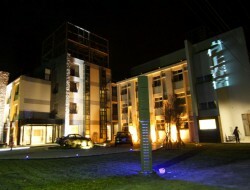 True Friends Inn- Hualien is grand opened in 2014. 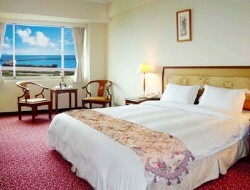 Situated in the center of Hualien, and 7 minute drive way from Hualien Train Station. It is nearby the famous Rainbow Night Market, Old Railway Walkways. Great access to the Hualien's natural tourist attractions, and heritage railways. Astar Hotel is a contemporary Hualien hotel located next to the ocearn with easy access to major Hualien leisure stops, including Cisingtan Scenic Area, Hualien Train Station, Nanbin Night Market, Hualien Railway Culture Park for your Taiwan travel. Fish Hotel Hualien is a modern hotel centrally located in Hualien City close to Hualien Railway Station, Hualien Airport as well as major Hualien tourist spots including Cisingtan, Hualien Dongdamen Tourist Night Market, Taroko National Park, and Meiluen Shan Nature Park for your Hualien travel. 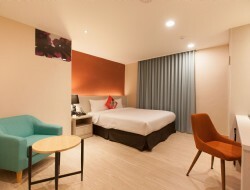 F HOTEL Hualien is a modern Hualien hotel with easy access to major Hualien leisure stops, including Hualien Carp Lake (Liyutan), Cisingtan Scenic Area, Nanbin Night Market, Hualien Railway Culture Park for your Taiwan travel. 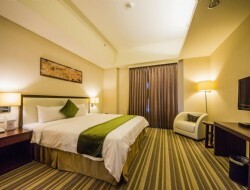 Hualien Charming City Hotel offers contemporarily designed Hualien accommodations delightfully set close to Hualien Train Station, Hualien Airport, Chihchiang Night Market and with easy access to Taroko National Park for your Taiwan travel. 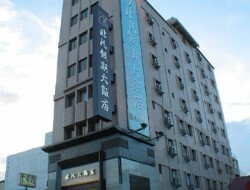 F HOTEL Hualien Zhongxiao is located in the center of Hualien City. 5 Only 5 min walk to Hualien Cultural and Creative Industries Park and 10 min walk Dongdamen Night Market, it is the most convenient and relaxing hotel in the city.